In 2009, Taylor's Corner Bed & Breakfast had four nestboxes mounted on their fence, but none were being used by native birds. 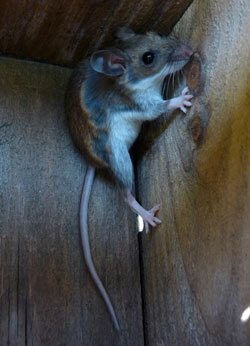 A few had mice in them because they were mounted on fence posts. Some needed repair. Chimalis has some nestboxes at nearby Taylor Brooke Winery. So we asked the innkeepers, Brenda and Kevin, if we could put up some new boxes on their lovely property in 2010, and they gladly agreed. Within weeks they had bluebirds nesting! Bluebirds and Tree Swallows eat insects which helps with pest control. Nestboxes for songbirds, owls and bats in also help maintain biodiversity in a vineyard landscape. More. There are now five nestboxes on the property, one of which is older. 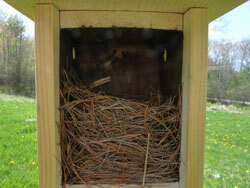 The bluebirds chose a new, pole-mounted wooden box with a predator baffle. This box is located in a premium spot - open grassland. Apparently they have just gone with 3 eggs which is a small clutch for bluebirds - usually they have 4-5 eggs. 5/1: not hatched yet. 5/10: babies hatched. 5/17: look good. 5/20: They are BIG! 5/21: 3 babies had fledged, Tree Swallows have moved in and have laid 3 eggs. X-Box: Wooden box with stained interior. First egg on 04/20, 3 eggs as of 04/22. 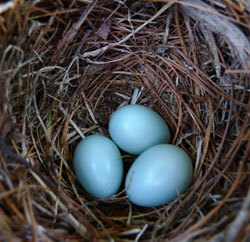 See Eastern Bluebird nesting timetable. House Sparrows (HOSP) may be a problem here, as they are in the area. HOSP are an introduced, invasive species that will attack and destroy the eggs, young and adults of bluebird and other native birds. In addition to being aggressive, they are extremely prolific. Successful bluebird landlords do not let HOSP breed in their boxes. Because they are non-native, they are not protected by the Migratory Bird Treaty Act. NABS style box by Tom Comfort: This box has a light interior. A House Sparrow appeared to have started a tunnel-shaped nest as of 04/22, and will be trapped. 04/23, 5/2: trapping unsuccessful - it's really hard to put a trap in this box because it opens from the side and is narrow. On 5/17, looked like Tree Swallow nest. 5/21: Definitely replaced with Tree Swallow nest - 3 eggs. NABS style box (older): A hole reducer was put on this box to make the entrance exactly 1.5" (it had been enlarged). A mouse was nesting in it (it is mounted on a fence.) The mouse nest was removed, but as of 04/22, they were adding material again. 5/2: empty. 5/17: mouse back, removed nesting material. 5/21: empty. Birch Box: This decorative box is adorable, but difficult to monitor since it opens from the bottom. An automotive inspection mirror will need to be used. Perhaps a chickadee will be drawn to it, as they sometimes excavate their own nests in rotting birch trees, which have a softer core. On 5/17, this had a House Wren nest in it. House Wrens may also be an issue, as there are brambles and woods near the fence-mounted boxes. House Wrens are native, but are very territorial, and often destroy the eggs of other birds and remove young nestlings. More. Peterson Box: Since Tree Swallows took over the bluebird box after the babies fledged, a second Peterson box was added, 15 feet from the NABS Tom Comfort Box. on 06/1. 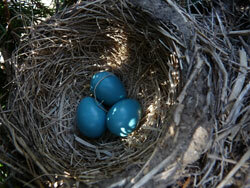 Bluebirds are not the only birds with blue eggs. An American Robin is nesting in an evergreen right in front of the B&B, and by 04/22, she had laid 3 eggs in a nest from a previous year that she was reusing. One nesting bluebird couple so far, 3 eggs, all hatched and fledged. Two nesting pairs of Tree Swallows. One pair of House Wrens. 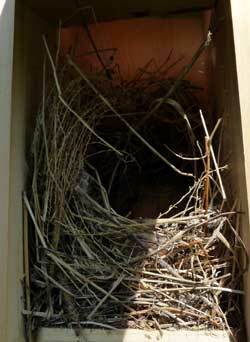 04/22: Female bluebird in box, 3 eggs in a large, neat pine needle nest. 04/23: tried putting spooker on box, but it was too windy and blues would not enter for 10 minutes+, so just put up perch. Just 3 eggs. Tree Swallows were flying overhead, pestering the bluebirds. Male was guarding the box. More paperwasps in TREX box. 5/21: 3 TRES eggs in TC box. Who does not welcome the beloved Bluebird and all that his coming implies? His cheery warble, heard at first as a mere wandering voice in the sky, heralds returning spring .... Snow may still lie in patches or drift in flurries; but when the Bluebird comes we know that spring is near.